(2017/Real Gone) 11 Tracks - First reissue of the original 1963 Crestview album! 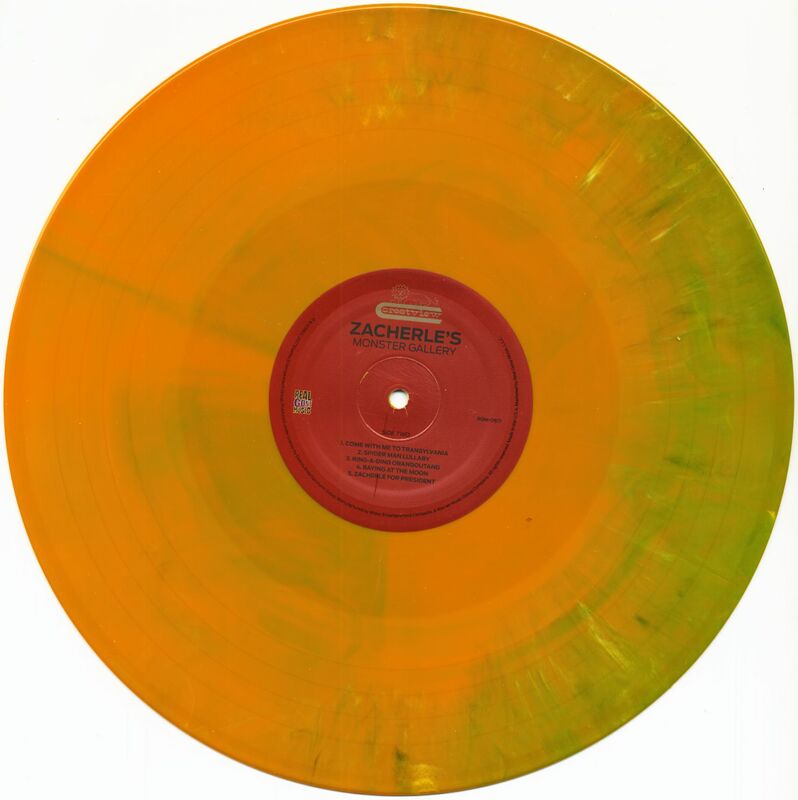 Strictly limited to 1000 copies in green and orange 'Pumpkin' vinyl! 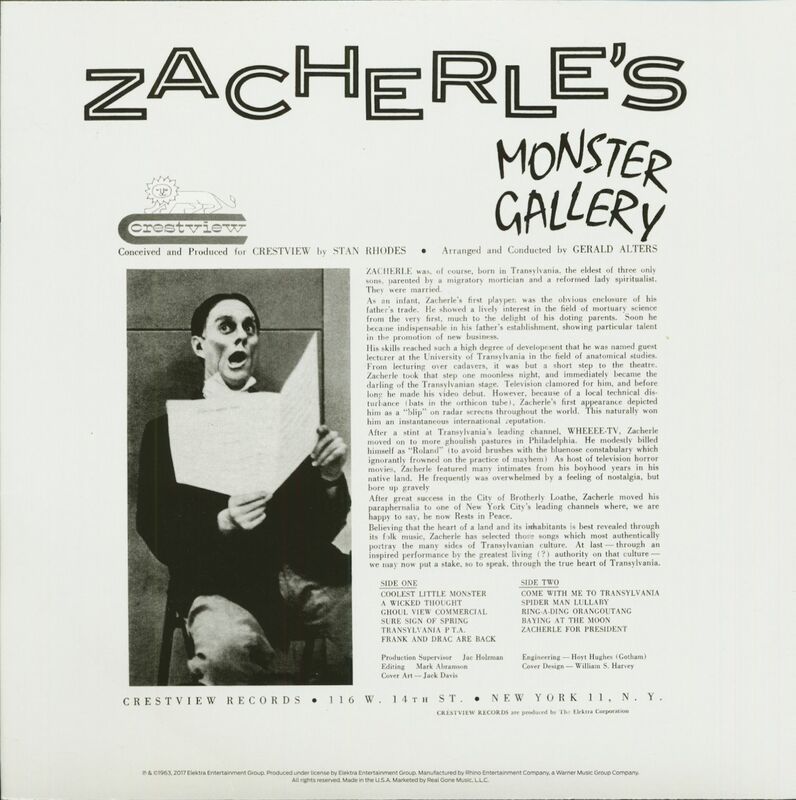 Zacherle was, of course, born in Transylvania, the eldest of three only sons, parented by a migratory mortician and a reformed lady spiritualist. They were married. As an infant, Zacherle's first playpen, was the obvious enclosure of his father's trade. He showed a lively interest in the field of mortuary science from the very first, much to the delight of his doting patents. Soon he became indispensable in his father's establishment, showing particular talent in the promotion of new business. His skills reached such a high degree of development that he was named guest lecturer at the University of Transylvania in the field of anatomical studies. From lecturing over cadavers, it was but a short step to the theatre. Zacherle took that step one moonless night, and irnmediately became the darling of the Transylvanian stage. Television clamored for him, and before long he made his video debut. However, because of a local technical disturbance (bats in the orthicon tube), Zacherle's first appearance depicted him as a "blip" on radar screens throughout the world. This naturally won him an instantaneous international reputation. Alter a stint at Transylsania's leading channel, WHEEEE-TV, Zacherle moved on to more ghoulish pastures in Philadelphia. He modestly billed himself as "Roland" (to avoid brushes with the bluenose constabulary which ignorantly frowned on the practice of mayhem). As host of television horror movies, Zacherle featured many intimates from his boyhood years in his native land. He frequently was overwhelmed by a feeling of nostalgia, but bore up gravely. After great success in the City of Brotherly Loathe, Zacherle moved his paraphernalia to one of New York City's leading channels where, we are happy to say, he now Rests in Peace. Believing that the heart of a land and its inhabitants is best revealed through its folk music, Zacherle has selected those songs which most authentically portray the many sides of Transylvanian culture. At last — through an inspired performance by the greatest living (?) authority on that culture — we may now put a stake, so to speak, through the true heart of Transylvania. 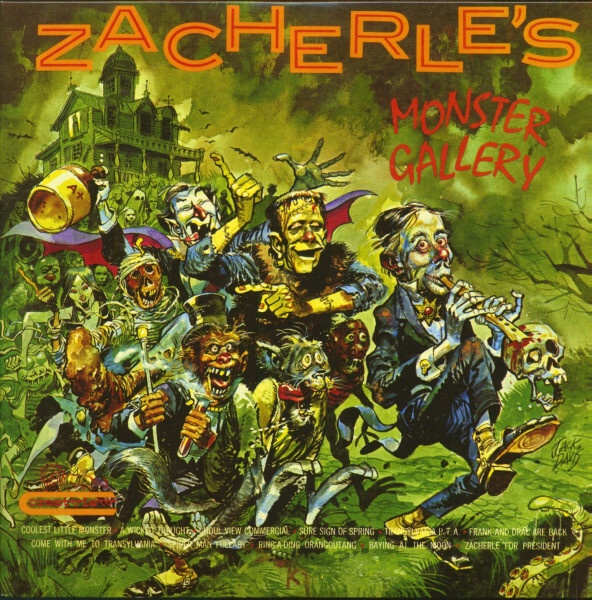 Customer evaluation for "Zacherle's Monster Gallery (LP, Color Vinyl, Ltd.)"